SLR-107CR - with Picatinny Quad-Rail System, 7.62x39 caliber, stamped receiver, chrome lined hammer forged 16.25 barrel, 24x1.5mm right-hand threads on front sight / gas block, removable muzzle nut, black polymer furniture, Warsaw Pact length left-side folding buttstock with compartment for cleaning kit, 2-stage trigger group, 500m rear sight, and side rail for attaching optics. Comes with one 10-round magazine, sling, oil bottle, and cleaning kit. Features a Picatinny Quad-Rail System. 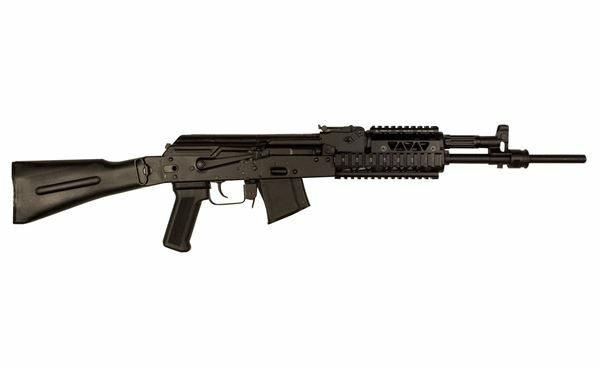 SLR-107CR - 7.62x39 caliber, stamped receiver, chrome lined hammer forged 16.25 barrel, 24x1.5mm right-hand threads on front sight / gas block, removable muzzle nut, black polymer furniture, Warsaw Pact length left-side folding buttstock with compartment for cleaning kit, 2-stage trigger group, 500m rear sight, and side rail for attaching optics. Comes with one 10-round magazine, sling, oil bottle, and cleaning kit. Features a Picatinny Quad-Rail System.